OCXO is an abbreviation of Oven Controlled X-tal Oscillator. OCXO’s are the highest performing type among Quartz Crystal controlled oscillators at the expense of power. The purpose to work at the turn over temperature is to minimize the crystals inherent contribution to external temperature changes. 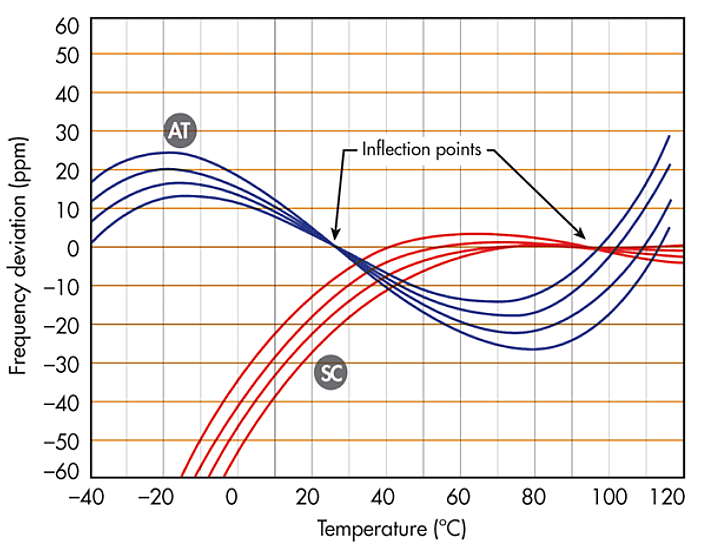 As can be seen on the graph the SC cut has a lower temperature coefficient at the turn over temperature compared to the AT cut. But the main advantage with the SC cut is the lack of transient response for dynamic temperature changes which is due to the lack of stress sensitivity leading to improved thermal behavior thus better frequency stability. An OCXO exhibits approximately 100 times improvement in frequency vs temperature dependence compared to an unheated crystal 2. One obvious disadvantage with OCXO’s is their higher power consumption and therefore makes them unsuitable for battery applications. Contrary to XO’s and TCXO’s which reach their specified frequency stability instantly after power on. The OCXO requires a warm up time of a few minutes before it reaches its specified temperature stability. We can see from the graph that the OCXO needs to move some 20 to 30 ppm from room temperature before it reaches its optimum working temperature which usually is around +85 deg C. The power consumption is higher during the warm up time but settles to lower values when the OCXO has reached its steady state of operation. Power consumption is inversely proportional to the external temperature. The internal power dissipation of the OCXO requires the crystal to be used at a temperature slightly higher than the maximum operational temperature of the OCXO because when the external temperature exceeds the max operational temperature the oven regulation ceases to work hence the OCXO will just follow the crystals own temperature dependence. Besides the best frequency stability vs temperature achievable in OCXO’s another major advantage is the superior short term stability. The short term stability can be characterized in the time domain and frequency domain. In the time domain the well known Allan Deviation is plotted vs measurement time (τ, tau) see graph below. Measurement times below 1s is best characterized in the frequency domain by Phase Noise measurements. The two graphs are measured from the same OCXO. In many applications OCXOs needs to be synchronized to a clock that is of higher accuracy. It can be done in a so called master-slave connection. Typically the systems have two states of operation, a synchronized state and when loosing lock the system automatically switches over to a “hold over” state. A typical application of this kind is a satellite receiver such as GPS (US), Glonass (Russian), Galileo (European) or Beidou (Chinese) that is disciplining an OCXO by outputting 1 pulse per second, PPS. This pulse is then steering the OCXO to synchronization. As long as the system is locked all clocks in the network is achieving the long term stability of the satellite system typically 1.10-12. However if the system loses lock it has to depend on the OCXOs internal performance. The actual hold over stability it can achieve depends on many parameters but major contributors are long term stability (aging) and temperature dependence. Long term stability (aging) – AGING in red text and lines. With a daily aging rate of 1*10-10 / day and no frequency offset at all ( frequency Offset = 0) would accumulate to a time error of 4 us / 24 hours. Many telecom systems have a requirement of 7 us / 24 hours leaving either very little room for frequency offset and / or temperature stability. An OCXO with a +/- 1 ppb temperature stability over the full temperature range of -30 / +70 deg C would have a temperature coefficient of +/- 1 10-11 / deg C. Let’s say we have a temperature variation of +/- 5 deg C during 24 hours that would give us +/- 5 10-11 in temperature stability (same effect as Offset error) leaving us with another 4 us / 24 hour, summarizing both effects of aging and temperature adds up to 8 us. 2. Precision Frequency Control Vol.2 Edited by E. Gerber and A.Ballato. Academic Press ISBN 0-12-280602-6.